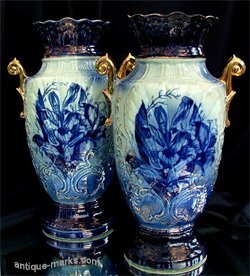 Flow Blue Porcelain is now a recognized category of antique porcelain that originated in the English region of Staffordshire. Flow Blue developed into a major porcelain category that can be attributed to the emerging English middle-classes of the late 1700s. In reality that categorisation is a misnomer. Flow blue was actually derived from a ceramic manufacturing technique and the porcelain is actually earthenware. The real roots of Flow Blue porcelain are firmly planted in early English pottery making, and how it grew into a major pottery category can be traced straight to manufacturers efforts to meet rising consumer demand. Flow blue popularity was due to the rise in prosperity of the English middle-class, and the expansion of the American export market in the early to mid-1800s. At that time, owning Chinese porcelain was an established status symbol of the English aristocracy and upper-class, but even with ever increasing imports Chinese porcelain was still too expensive and scarce to fill the needs of the new English middle-class. The efforts of English potters to imitate Chinese porcelain and serve this new market demand resulted in the creation of Flow Blue Porcelain. Around 1775, English potteries, developed a transfer process for copying designs and patterns onto their pottery. As the demand for porcelain grew, more and more potteries opened up to meet that demand and the hub of this new activity was the English region of Staffordshire. Many of the famous names that we recognize today, started in Staffordshire including Spode, Wedgwood, Royal Doulton, and of course the Staffordshire potters. b) This flow or bleeding of the blue coloring produced designs that resembled the designs used on more expensive porcelain. 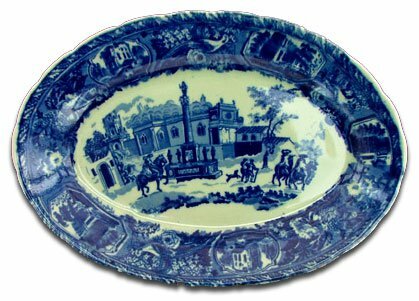 Previously, early English pottery was primarily Delftware, but as the Staffordshire pottery industry grew, and the use of local Devonshire clay produced new porcelain formulations, the potters changed to a new more durable and more porcelain-like product called creamware, (also known as hard-paste porcelain or Ironware). But it was the concentration of the ceramics industry in Staffordshire, near the source of Devonshire clay, and the introduction of the new formulation that produced creamware. Creamware was lightweight durable and inexpensive. It was a key contribution to ceramics development and was exported and copied throughout Europe. Its introduction spurred the use of the flow blue process as a porcelain product that could satisfy the demands of this new and emerging market. It wasn’t long before the majority of potters were using this highly desireable combination for most of their production. Around 1820, Josiah Wedgwood introduced a new type of porcelain. He utilised a combination of cobalt blue oxide that produced an elegant blue coloration, which together with the use of the transfer-print process, proved to be the key to manufacturing a product that could successfully compete with the quality of the more costly imported porcelain. Creamware’s creamy white base color, hardness, and durability, made it an attractive foundation for the blue colored designs that were the trademark of Chinese porcelain, and so the Flow Blue porcelain, (also known as blueware), phenomenom was born. A hungry English market saw this new style as a perfect alternative to the expensive Chinese porcelain, and its durability made it a viable export product for the growing American market. 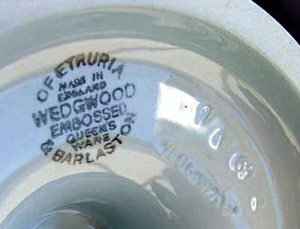 On seeing the success of Josiah Wedgwood’s porcelain, other pottery companies quickly introduced their own lines. They also utilised a creamware type formulation and the cobalt blue coloring. Famous names like, Spode, Davenport, Doulton and dozens of not-so famous names, all jumped on the Blue Flow bandwagon. Soon not only did the design style of this type earn its own name, Flow Blue porcelain, but ceramic produced by these potters attained its own classification of Staffordshire Blue. Staffordshire Flow Blue porcelain remained popular until around 1910, when demand began to wane. Most of the potteries followed new directions with their porcelain creations. Although some continued to produce Staffordshire Flow Blue until as late as 1940. Staffordshire itself continued as the hub of English pottery and porcelain creations well into the twentieth century. A few of the more well known names are still producing today, but Flow Blue Porcelain (or Blueware porcelain), had its day and by around 1940 original Flow Blue porcelain production had ceased entirely. And although pieces from American, Italian and German potteries do exist, it is rare to find a piece that isn’t from the English Staffordshire region.